How Ikea Flat Pack Assembly Evolves? IKEA is considered to be the first flat pack furniture companies in history. Here is how pioneer in self-assembly furniture constantly pushes innovation and creativity. Ikea aims to further improve efficiency and thus constantly delivery more affordable flat pack furniture pricing. Here is an short report for some of IKEA’s most used units, that illustrates how the ready-to-assemble furniture pioneer constantly pushes furniture evolution and sustainability boundaries. By making flatpack assembly more efficient, the company has reduced pricing by 34%! Before the montage improvement, the flat pack lamp used to consist of 33 pieces. Now it has only 9 pieces. This knock-down improvement allowed IKEA to reduce packing space by the staggering 27%. 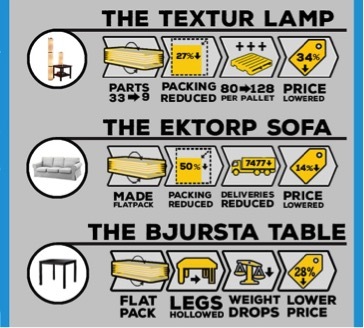 The change helped reduced the number of lamps IKEA can transport and deliver from 128 to 80 per a single pallet. The extra 48 flatpacks stand for another 37.5% of inventory shipped at the same cost. By optimizing the way flat-packers assemble, IKEA managed to lower prices by the staggering 34%! The Ektorp sofa was a non-assemblable unit. Now it is a flat pack, which lead to a price drop of 14%! Before the montage upgrade, the sofa used to be a one piece unit. People did not have to put anything together, nor montage a single part. IKEA’s designers realised that if they turn it into a ready-to-assemble flatpack, they will reduce packing by the up to 50%! Flat pack assembly improvements lead to reducing transport by more than 7000 home delivery trucks within the first year. Now being a RTA piece of furniture, the Ektorp sofa lead to the staggering savings of €1.2 million for IKEA in a single year! By improving weight, the price per flatpack was lowered by 28% on a yearly basis. Many furnishing units are assembled from solid wood, but at a certain point IKEA’s designers realized that if they go for hollow table legs, they could achieve impressive cost efficiency. This way the company managed to yet again achieve impressive cost efficiency due assembly improvements. Do lower prices mean lower quality? Absolutely NO. IKEA’s is a worldwide leader and as a reputable company it can not afford to compromise on quality. IKEA owns many testing labs throughout the world. Products like Ektorp, Bjursta and Textur go through various test, like heavy hammering by robot arms, pressure testing and many more. Beds, mattresses, cupboards, drawers, all units pass a list of tests for montage and assembly sturdiness and dismantling stress tests. According to rumours, the flat pack pioneer plans to expand its testing lab in Älmhult up to 6.500 sq.ft. As a result of this complex system for assemblage and sturdiness improvement, Ikea has to recoup a products of its shelves as often as each month! In order to keep up with latest trends and consumer demand, the flat pack company has built and put together more than 100 testing facilities around the world! 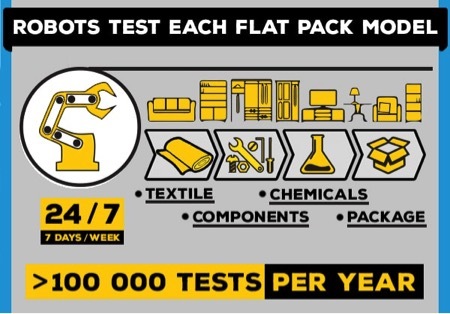 The approximate number of all read-to-assemble furniture tests is more than 100 000 per year! The very nature of flat pack furniture is improvisation and creativity.